The Sony Cyber-shot DSC-TX9 is the latest addition to Sony's extensive range of slim, compact and stylish pocket cameras. The TX9 is one of the first Cybershots to offer 3D Sweep Panoramas, taking up to 100 images and automatically combining them to create a stereoscopic pair of frames. If you don't have a 3DTV, the Sweep Multi Angle mode shoots fifteen frames and creates a 3D-style image that can be viewed from different angles either on the camera or a conventional 2D TV set. The new Superior Auto mode takes 6 images and combines them to create one low-noise picture with wide dynamic range, while the Background Defocus mode makes it easy to blur the background to make the main subject stand out. The 12 megapixel TX9 has an Exmor R back-illuminated CMOS image sensor which promises to greatly improve low-light performance, resulting in cleaner images with less noise. 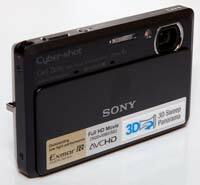 Featuring a metal body, sliding front plate and folded lens optics, the super-slim Sony TX9 offers a 25-100mm equivalent 4x zoom lens, 3.5 inch touch-sensitive rear screen, SteadyShot optical image stabilisation, face and smile detection technology, ISO 3200 and intelligent scene recognition. The Sony TX9 also boasts continuous burst shooting at up to 10 frames per second at full resolution, clever Sweep Panorama mode for extra-wide landscapes, and 1920x1280 pixel 1080i HD movie recording with stereo sound and a HDMI output. Compatible with both SD(HC) and Memory Stick PRO Duo memory cards, the Sony TX9 camera is available in black, gold and pink for around £380 / $399. The DSC-TX9 is another predictably ultra-stylish entry in the Cyber-shot 'T' series, with a slim profile of 17.5mm in depth, glossy fascia, credit-card size and sporting a slide open and shoot lens cover mechanism that powers up the camera at the same time, thus ensuring that taking a picture is really, really easy. Idiot proof one might say, especially with the intelligent auto mode selected that recognizes common scenes and adjusts the on-board settings to achieve the desired result. The TX9 feels lightweight enough at 150g to slip into a shirt pocket, yet doesn't seem at all brittle. In fact it's as well made and solid as we'd expect a Sony product to be, plus as usual there's a choice of body colours. As ever with Sony models though , you pay something of a price premium and the TX9's £380 / $399 asking price feels around £50 / $50 too high. The TX9 has a massive 3.5-inch, 921,600-dot high resolution touch screen LCD, which presents a wide-angle format ratio yet displays images in the standard 4:3 ratio format. It thus leaves room left and right of the screen for operational icons, selected with a fingertip or the end of the plastic stylus pen included in the box, which can be attached to the wrist strap. Despite doing this at the outset of our test period, we rarely used the stylus, a finger tap making for quicker and more intuitive operation, though you'll be constantly wiping the LCD clear of smeared fingerprints as a result. Fortunately with near instant response the TX9's screen performs as intuitively you'd expect it to: captured images can be scrolled through with a sweep of a finger, or tapped in playback mode to progressively zoom in and check sharpness. Frequently used functions can also be dragged into the camera's menu screen. An on-board Bionz processor helps ensure those rapid response times and that overall operation zips along. The Cyber-shot DSC-TX9 offers a modest sounding 12.2-megapixel effective resolution, especially so in the era of 14MP compacts. Albeit this is from an Exmor R CMOS sensor which its manufacturer claims makes for a low light performance that is twice as effective as 'conventional' models. The TX9 also offers the option of recording JPEG still images and Full 1080i HD video in the AVCHD format at 30 frames per second to either Sony's own Memory Stick Pro Duo media or the more commonly available SD or SDHC cards. The two share the same slot, but are obviously not of the same size. This makes for a rather fiddly insertion of a Memory Stick into the central portion of the wider SD-sized slot, where due to its narrower dimensions it 'wiggles' about a bit. Still, good to see compatibility with SD offered on a Sony camera, the company historically liking to stick with its own proprietary media. Design wise, the only break from the camera's minimally slim and streamlined proportions is a raised lip on the corner of the top plate which proves useful in providing a point of purchase for the fingertip when operating the lever for the commendably silent 4x optical zoom. Once again this Cyber-shot employs a folded optic that ensures at no point does the lens stand proud of the body. Thus you don't get the problem of the sliding lens cover clunking against the optic itself when powering down the camera. The fact that the zoom operation is silent means that its full extent can also be usefully accessed when shooting video, so users don't have to suffer degraded image quality from having to utilize a digital zoom instead when recording movies. The TX9's lens starts out at a wide-for-its-class 25mm (35mm equivalent) and runs to 100mm at the telephoto end, making it as adept at shooting landscapes as it is group portraits. Next to the lens at the front is an indicator lamp for the self-timer/AF assist lamp, built in stereo microphone plus very narrow lozenge shaped flash. These, like the lens, are all hidden behind the sliding lens cover/faceplate when the camera is inactive, so protected from fluff and scratches when transporting the camera in a pocket. For those photographers looking to take in just a little bit more, the camera also features Sony's impressive-in-action Sweep Panorama function. This rattles along capturing a series of images and stitches them together in camera to provide a single narrow letterbox format image providing a wider view that the lens or a standard panorama feature would allow. New to the TX series are 3D Sweep Panoramas, with the TX9 taking up to 100 images and automatically combining them to create a stereoscopic pair of frames that can then be played back on a 3D TV set (if you're lucky enough to own one). We saw some examples on the Sony stand at Photokina and were uitably impressed. For all those of use without a 3D TV, the new Sweep Multi-angle mode shoots fifteen frames and creates a 3D-style image that can be viewed from different angles either on the camera or a conventional 2D TV set, although the effect is very subtle. Aiding handheld shooting performance in low light are also Twilight (found amongst its nine scene modes) and Anti Motion Blur modes. Again selecting these prompts the shooting of a burst of images to combat the effects of hand wobble - in each case six frames which are then combined to produce a single (in theory) low noise, blur free image. However we found in practice that while indeed minimizing softness, this seems to have the knock on effect of sapping colour from subjects, resulting in a literally pale imitation of the scene before the lens. So while useful in getting handheld shots one might otherwise have not attempted at all, the solution is not a wholly perfect one. The new Superior Auto Adjustment mode takes 6 images and combines them to create one low-noise picture with wide dynamic range, particularly useful for low-light environments, although there wasn't much difference between this and a well-exposed image taken with one of the other in most instances. Background Defocus is more obviously effective, making it easy to blur the background to make the main subject stand out, although only if they're about 30cms from the camera and only if you don't mind the artificially smeared background effect. The other two physical controls on the Sony TX9's top plate are a narrow lozenge-shaped shutter release button, plus what at first feels like a rather extraneous on/off button. However if operating the camera with the sliding faceplate mechanism otherwise closed - to review photos for example, rather than take them - then this dedicated power button does indeed come in handy. As with any digital compact that strives to make itself as small as possible, there are some compromises with the TX9. We've already mentioned the single yet dual format card slot, and another is the positioning of the lens, which, by being located over at the far edge of the faceplate, can often fall victim to fingertips straying into shot when gripping the camera in both hands. Though, with use, you become more aware of where you're putting your fingers to avoid this irritation, hand the camera to anyone else for a quick portrait of you and yours and there will inevitably be tell tale finger-shaped blobs appearing in the corner of the frame. The back of the camera continues the minimalist design ethic of Sony's T-series, being given over entirely to the 3.5-inch widescreen ratio touch panel LCD with the only physical controls being dedicated Playback and Camera/Movie buttons sitting just above it where the edge of the backplate meets the top plate. Otherwise a couple of raised ridges to the right hand side of the screen provide some purchase for the thumb when gripping the camera, the mirrored faceplate at the front meaning that it's easy for fingers to otherwise slip and slide around. The dedicated playback button is useful in that with the camera otherwise in its dormant state it can be pressed to quickly review images without having to press an additional power button to turn the camera on first. Again this not only makes for intuitive user-friendly operation, but also speeds up use of the TX9. Slide open the lens cover at the front and the LCD blinks into life in just over a second, briefly displaying the Cyber-shot logo before providing a view of the scene or subject in the absence of an optical viewfinder alternative. As mentioned earlier, when taking still photographs the screen is cropped to a 4:3 ratio as a default, functional white icons presented legibly against black bands either side of the main image rather than directly across it. Among these icons is a means of choosing from a selection of recording modes. Here we have the default point and shoot setting of Intelligent Auto, the previously mentioned Superior Auto Adjustment, regular Program Auto, iSweep Panorama, Movie Mode, Background Defocus, 3D Shooting and finally the Scene Selection mode. Select this last option and the screen fills with a plethora of further icons, including pre-optimised settings for Backlight Correction HDR, which compensates for subjects backlit by the sun, Anti Motion Blur, Hand-held Twilight, High Sensitivity shooting, Soft Snap, Landscape, Twilight Portrait, Twilight, the food photographing 'Gourmet' mode, along with the more familiar Pet, Beach, Snow, Fireworks, Underwater and lastly High Speed shutter option for practicing your golf swing. When shooting stills there's the further option to adjust the point of focus simply by tapping a portion of the LCD screen - the camera gives the user a text prompt to actively encourage this - thus providing the ability to bias attention to something or someone who might not be traditionally dead centre of the frame. Furthermore the camera will actively track the subject if it moves around the frame, ensuring that it remains well-exposed and in focus. The above shooting modes aside, also presented within the black bands either side of the screen are a means of quickly starting movie recording, along with an icon for controlling the flash (merely off or on in intelligent Auto mode) and altering self timer settings (10 seconds, two seconds or off). Continuous or burst shooting can further be selected here, with a choice of 'Hi', Mid, or 'Lo' speed options, the TX9's maximum being an impressive 10 frames per second which it rattles through machine-gun like, the resultant shots slowly appearing as a collected series of thumbnails on its rear screen for review. Further on-screen icons in capture mode include a virtual playback button to go with the physical button also provided, plus a self-explanatory virtual 'Menu' button. Additional on-screen info squashed into the screen's top right hand corner gives an indication of battery life, the number of shots remaining, image ratio and resolution. Tap the Menu icon and even more options are presented to the user. It's here we're offered the chance to switch to Easy mode, which simplifies the menu options, and access Smile Shutter mode, with three options governing how pronounced a smile you want the camera to recognize. There's also options to adjust the image size and ratio, with the ability to shoot stills in 16:9 format rather than 4:3 albeit with a resolution drop to 9 megapixels at best, select Macro mode, adjust the Exposure Compensation (+/- 2EV), ISO speed and White Balance, change the Focus and Metering modes, plus turn Face Detection and Display settings on or off. Top left of the menu screen a small toolbox icon also appears; its placing meaning that it is easy to overlook. Tap this inquisitively however and four further settings folders are presented. In decreasing order of importance, the top one, denoted by camera and spanner icon, is a Shooting Settings folder, just below which is a second Main Settings folder, then a Memory Card Tool folder, and lastly Clock Settings (date and time etc) weirdly get a folder all to themselves. Going back to the Shooting Settings, it's here if shooting in Program Auto mode that the user can summon up the AF illuminator (or turn it off), as well as the compositional aid of on-screen grid lines, digital zoom, red eye reduction when using flash, plus blink alert to warn if a subject might have closed their eyes at the crucial point you fired the shutter. LCD brightness can further be adjusted. All the essentials you'd expect are here in fact. A half press of the shutter release button and the camera determines focus and exposure in the blink of an eye. Take a shot at maximum 12.2 megapixel resolution and with barely perceptible shutter lag a shot is committed to memory in two seconds, the screen briefly freezing with a display of the captured image whilst it is written to memory. Switch to playback mode to review what you've just shot and left and right directional arrows appear at the bottom right hand corner of the screen for tabbing through previous images too. In playback mode we have the further ability to view/search images by date via an on-screen calendars - or view them collectively as a series of thumbnails, the tapping of any one of which displays it full size on the screen. There's additionally the ability of course to view all images on the back screen in the form of a slideshow accompanied by a selection of different musical styles, or hook the camera up to your TV to do the same. Curiously when we did this, the camera displayed only images shot in 4:3 ratio format, choosing to omit the images shot in Sweep Panorama mode from its selection. A press of Menu alternatively when in playback mode and, along with the menu options offered in capture mode, we have the ability to paint or draw cutesy hearts onto images - the kind of thing beloved of Japanese teenage girls - with a virtual eraser button also presented to wipe clean any such doodles. Colourfully chintzy borders or frames can further be chosen to garnish your in-camera 'masterpiece'. Limited retouching can also be carried out in camera - in the form of red eye correction, trimming or cropping the image as a whole or using unsharp mask to add some saving grace definition to slightly soft shots and avoid having to do the same in Photoshop. And all this with the press or swipe of a fingertip; no further skills necessary. Once you've got to grips with the multitude of options on offer and got used to the touch-screen operation the Sony TX9 is easy and fun to use. 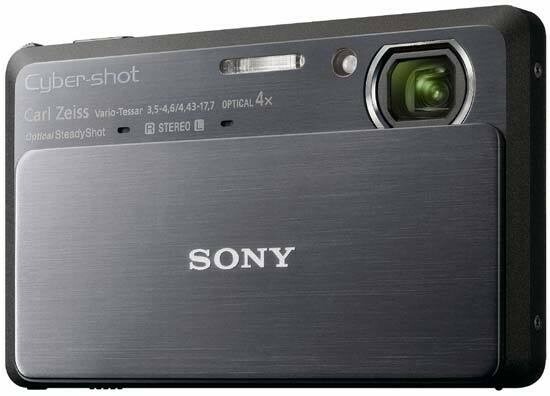 There are more options here than provided on regular point and shoot cameras so that users won't get bored easily.